For you parrots out there who like to come out once and while but you get put right back because of you poop on the floor or the furniture, tell your parents to start parrot potty training you. It’s very easy to learn. Here is how my Papa taught me. He waits for me to poop in my cage while saying to me "sit" because sit sounds nicer than go poop. Then when I do he takes me out and plays and cuddles with me for a short time. Then he puts me back in my cage and tells me to "sit again" and when I do (so to speak) he takes me out and plays and cuddles with me again. After a short time the only place that I want to "sit" is in my cage or on my play stand. Tell your parents potty training parrots is much easier than potty training dogs, cats or even children. When I first decided to become a parrot trainer I read up on all sorts of training techniques from supposedly good parrot trainers. These trainer’s birds were amazing. Their Green Wing Macaws were capable of jumping off the top of hotel roofs, without any restraints and would willingly fly down from the roof and land on their trainer's hand. Two Military Macaws at Whipsnade Zoo, Bedfordshire, England. The macaw on the left has damaged feathers on its chest and abdomen probably because of a feather plucking habit. It was an amazing thing to watch, so amazing that I decided to follow all instructions he gave me to the core. I obeyed everything he said, including a method that I later realized, was FAR from the best way to train a parrot not to bite. The method that this trainer taught me was what is known in the animal training industry as flooding. Flooding is where you put an animal in a situation and force it to comply with whatever means is necessary. In my case, I was trying to get my Blue and Gold Macaws to willingly come out of their cages without biting me. And I was instructed to take two wooden dowels, one in each hand, and proceed to forcibly put my Blue and Gold Macaws with the wooden dowels. Obviously, my Macaws did not like this situation as they didn’t like being touched. But I was instructed that they would soon realize that the touching was OK and that I (the trainer) was the boss and not the bird. This technique was to be executed so as never to harm the bird, but scare it into submission. My blue and Golds would scream, flap their wings and bite at the sticks, and each time he did so I was to overwhelm them even more by touching them with the other stick in my other hand until they realized there was no hope and finally gave up. Luckily for me, this technique works on Macaws that like to attack their owners, but it’s woefully ineffective on other species of parrots, especially certain species that are prone to running away in fear vs. holding their ground and putting up a fight like my blue and gold Macaws were. 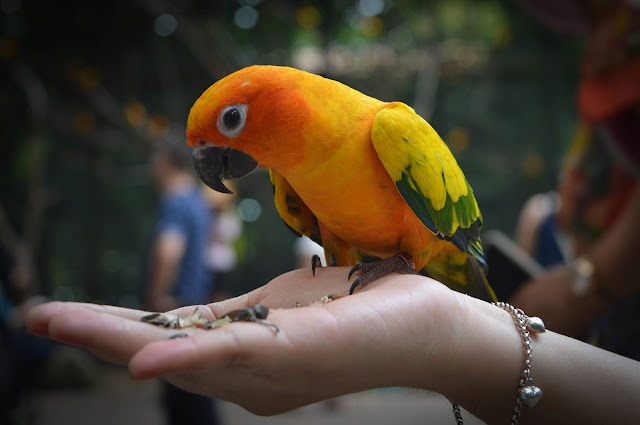 In hind sight, there are much more gentle approaches to training that not only work faster than the flooding method I’ve just described but work for helping parrots of all temperaments learn to not bite. It involves putting a parrot in situations where he has to choose to do or not do something and is rewarded for the correct choice, and ignored with the wrong choice. The end result is a parrot who realizes that you are trying to communicate with him in a nice way because you’ve never scared him or hurt him. Plus the parrot realizes that life with you is a puzzle… and it’s his job to figure out because there’s always a nice treat in it for him if he can figure out the answer. This type of training is extremely mentally stimulating and with just a few short practice sessions a week with a parrot can be the perfect preventative medicine for all sorts of behavior problems like feather plucking, screaming, and boredom. 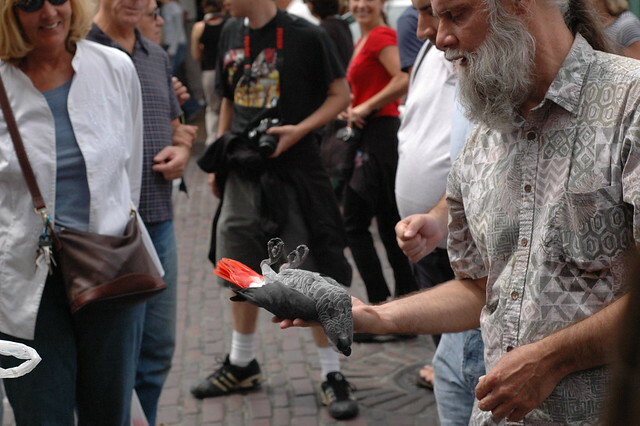 About the Author: To learn more about how Chet Womach teaches positive reinforcement my Blue and Gold Macaws visit http://www.birdtricks.com/macaws.html and sign up for my free ezine jam packed with parrot training tips you can start using today.